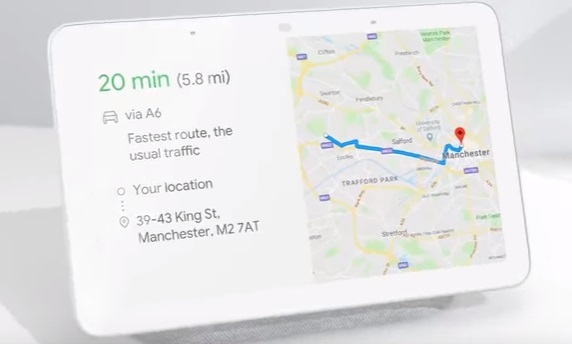 Google has just released a new ad, introducing Google Home Hub, which is a new Google Assistant device with a screen. The spot showcases some of the most important features of the Home Hub, for which the tech giant has revamped services like Search, Maps, Calendar, Photos, and YouTube. Users will be able not only hear the responses from Assistant, but also see them, they will be able to view their entire, control and manage all their smart home devices in their home thanks to a new feature called Home View. Set to support Google’s Voice Match feature, the Hub will be able to recognize different users’ voices, pull up calendars, commute times, reminders, and more, right on the home screen. The ad shows that the device can also adjust to the ambient light in the room, using a dedicated sensor to adjust the display for the lighting in real time. “For the help you need, just ask,” an onscreen line reads and the question “Hey Google, what should I make for dinner tonight” along with a series of dish recipes, appear. The ad also highlights that you could listen any type of music you want, such as French hip-hop, “relive your Paris trip as soon as you’re home,” and “find out what goes bump in the night”. Google Home Hub, announced earlier today, October 9th, also features a 7-inch LCD touchscreen display, a “full-range” speaker, a two microphone far-field mic array, as well as support for Bluetooth 5.0. Coming in four colors – green (Aqua), dark grey (Charcoal), pink (Sand), and white (Chalk), and including six months of free YouTube Premium service, the Home Hub be available for purchase on October 22nd for $149 in the US, UK, and Australia. Those willing to have it in their home can pre-order it starting today. At the event held today, in New York, the tech giant also unveiled its third generation of smartphones made under the Pixel brand.